LEXINGTON, Mass., Oct. 23, 2017 /PRNewswire/ -- Agenus Inc. (NASDAQ: AGEN), an immuno-oncology (I-O) company with a pipeline of immune checkpoint antibodies and cancer vaccines, today announced the launch of a subsidiary company for its cell therapy business, AgenTus Therapeutics, Inc. The subsidiary is focused on realizing significant value for both companies, enhancing business focus, speed, and efficiency toward the realization of breakthrough I-O "living drugs" to advance cures for patients with cancer. AgenTus will have licensed intellectual property assets from Agenus, its own management team and governance. 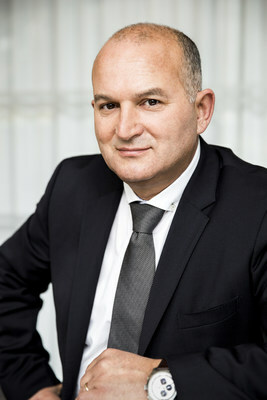 Bruno Lucidi has been appointed as CEO of the AgenTus subsidiary. Lucidi brings more than 30 years of experience in the pharmaceutical, biotechnology and financial industries with an impressive track record of building businesses and introducing innovative products into therapeutic markets. "AgenTus will operate with remarkable science, innovation, and access to Agenus capabilities and expertise, all giving the subsidiary competitive advantage through the delivery of innovative living drugs to cancer patients looking for cures," said Garo Armen, Ph.D., Chairman and CEO, Agenus. AgenTus will employ naturally-derived and engineered receptors, specifically T Cell Receptors (TCRs) and Chimeric Antigen Receptors (CARs), designed to supercharge human immune effector cells to seek and destroy cancer. AgenTus will advance adoptive cell therapy formats which would enable off-the-shelf living drugs. Current pipeline assets will be designed for potential utility both as single agents and as components of combination regimens in both solid tumors and hematological cancers. AgenTus is advancing lead programs through preclinical evaluation. AgenTus will collaborate with Agenus to leverage the proprietary technologies, pipeline, and expertise of parent company Agenus. World-class scientists at AgenTus will have access to discovery platforms capable of identifying and optimally engineering novel TCRs and CARs through a multifunctional approach, including bioinformatics, structural and computational biology, molecular and cell biology, and proprietary, best-in-class cellular display platforms. Living drugs are derived through a process called Adoptive Cell Therapy (ACT) by which a cancer patient's immune cells are removed, reengineered, and then reintroduced back into the body to bolster the immune system against cancer. "AgenTus seeks to develop first in class adoptive cell therapies utilizing its proprietary TCRs to treat cancer," said Bruno, Lucidi, CEO, AgenTus Therapeutics. "We understand the mechanisms of our cell therapies in great molecular and biochemical detail, thanks to the outstanding scientific work by our Agenus colleagues to date. We expect our differentiated approach to have key competitive advantages." The company intends to utilize both autologous and allogeneic manufacturing processes at different stages of development. "The goal of our technology is to ultimately enable AgenTus to develop living drugs in practical, off-the-shelf cell formats," continued Lucidi. "These living drugs are designed to be scalable, straightforward to administer, and are expected to target both solid tumors and cancers of the blood." This press release contains forward-looking statements that are made pursuant to the safe harbor provisions of the federal securities laws, including statements regarding the expected value to be realized from creating AgenTus and AgenTus' prospects, business plans, assets, capabilities, operating plan and expected collaboration with Agenus' platforms and assets. These forward-looking statements are subject to risks and uncertainties that could cause actual results to differ materially. These risks and uncertainties include, among others, the factors described under the Risk Factors section of our most recent Quarterly Report on Form 10-Q or Annual Report on Form 10-K filed with the Securities and Exchange Commission. Agenus cautions investors not to place considerable reliance on the forward-looking statements contained in this release. These statements speak only as of the date of this press release, and Agenus undertakes no obligation to update or revise the statements, other than to the extent required by law. All forward-looking statements are expressly qualified in their entirety by this cautionary statement.